Spartan Scientific proudly manufactures quality DIN-style solenoid valves for general as well as special and custom design applications. 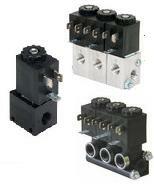 Our solenoid valves include control valves and automatic condensation removal drain valves. Made with premium materials to exacting standards and checked by state of the art measuring devices, the Spartan solenoid offers the best value for function on the market today. A guarantee of high cycle life as well as rugged and trouble free life of the valve is Spartan’s quality goal. More than just conversion of electrical signals into fluid mechanical motion, the Spartan solenoid is the culmination of many years of experience and knowledge of media control. 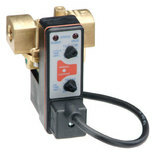 Spartan Scientific direct acting solenoid valves are designed for long life and trouble free service in media control. Spartan's high tech solenoid operator when coupled with precision made valve bodies of zinc die casting, engineered polymers, brass or stainless steel, are a winning combination of value for many applications.The Spartan direct acting valve line comes in ported and manifold mounted versions as well as cartridge type versions. Spartan Scientific produces a full line of diaphragm process valves which incorporate the state of the art solenoid, premium materials made to exacting specifications and quality standards. Spartan diaphragm valves offer a port range from 1/8″ to 2″ NPT, BSPT, as well as manifold mounting styles. This unique and targeted style of valving was produced to fill the demanding needs of Spartan’s customers. Materials used are brass, stainless steel as well as engineered polymers for value and long trouble free service. Clayton Controls is a Spartan Scientific distributor in California. We offer technical support to help our customers solve their applications.